Maple shells with reinforcing hoops have a longer, slower sustain ratio while birch shells without reinforcing hoops have a shorter and faster sustain. Maple produces a warmer, lower fundamental tone than birch. The outer face, or veneer, has very little influence on sound. The core plies and inner ply have the most influence and significant influence on sound, respectively. In experimenting with different exotic woods as alternate shell making materials, DW's Custom Shell Shop discovered that in addition to the different tonal qualities inherent in every unique type of wood, slight alterations in the shell's construction can also greatly influence sound. Some of the woods sampled possessed a vertical grain pattern that when tested, dramatically lowered the pitch of the shell. Thus, VLT (Vertical Low Timbre) was born. For those players who prefer a lower overall tone while still maintaining maximum resonance and attack, VLT can be ordered as an option on all Collector's Series Maple Drums. VLT consists of arranging the grain pattern of the plies in the shell so the outermost and innermost plies run vertically, and not the traditional horizontal. The vertical grain places less tension on the shell, allowing it to vibrate more freely, resulting in the lowered fundamental pitch. So, what's the difference between VLT and Built-In Bottom? In a nutshell, the optional VLT feature utilizes vertical plies on the inside and outside of the shell, while Built-In Bottom only has vertical plies inside the shell. It provides a more low-end response. While optional on all Collector's Series drums, Built-In Bottom comes standard on Collector's Series bass drums and tom-toms 14" and greater. Making drums sound better, at DW it’s what we do best. So what exactly is X Shell technology and how does it work? It all started with our foray into VLT™, or Vertical Low Timbre Technology. We found that in experimenting with alternate ways to cross-laminate a shell, the tension on the shell could be greatly decreased if the majority of plies were run vertically, rather than horizontally. Just like a guitar string, the tighter it gets, the higher in pitch it goes. Shells must be cross-laminated for strength, so the idea of designing a completely vertical shell to achieve optimal low frequencies was never an option. Until now. Enter X Shells. The concept was derived from our popular line of VGE (Vertical Grain Exotics). Sure, we had been laminating veneer in a diagonal orientation for a while, but had never considered the sonic benefits until Master Drum Designer John Good proposed it, “If we can mimic the effect of a complete VLT shell, we’ll have created the lowest sounding drum ever.” The first prototype was made and the result was a home run. Exactly what Mr. Good had anticipated, big, full sounding drums with a huge fundamental, and all of the warmth, resonance and attack that Collector’s Series drums are known for. X Shells are crafted from hand-selected North American Hard Rock Maple in an 8-ply configuration with a 3-ply finger-jointed reinforcement hoop. The shells can be custom ordered in any Collector’s Series size, finish, drum hardware color or factory option. It’s a giant leap forward in shell technology and everyone wins! 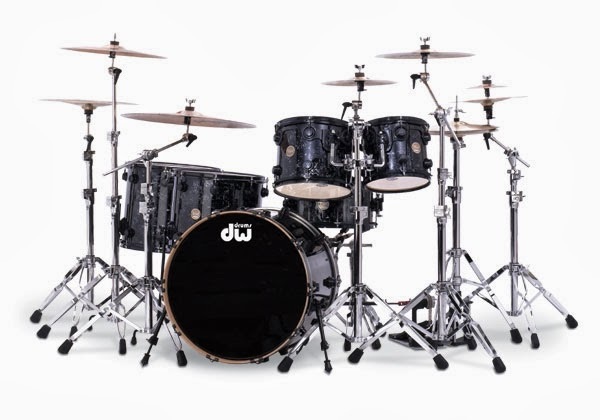 The only way to fully appreciate the massive sound of these drums is to visit your local authorized DW Drums dealer and experience them for yourself.